Quote: We reviewed the translation service DeepL in 2017 when it came out and found it to produce -- on average -- better translations than established services such as Google Translate (Mozilla is working on implementing it in Firefox) or Bing Translate. One of the biggest issue of the service was that it supported only a handful of languages. The service started with seven supported languages that you could translate between; these were: English, German, French, Spanish, Italian, Dutch and Polish. 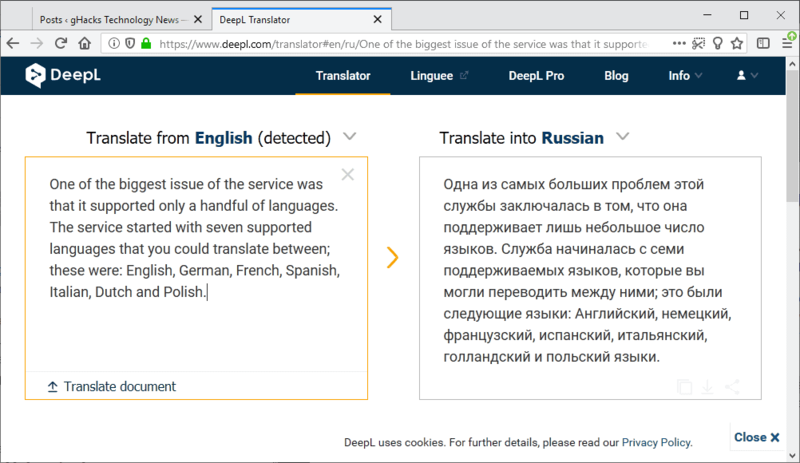 The developers of DeepL added a useful document translation feature to the service in 2018 but did not add support for additional languages to the service up until now. DeepL announced support for two additional languages today. Users of the service can translate to and from Russian and Portuguese as of today. The two additional languages increase the number of supported translation languages to nine. The number pales against the more than hundred languages that other automatic translation services support but if the quality is better, and it seems to me that it is, you'd want to use DeepL whenever possible.